Kids Fest is a day of food, fun, and entertainment for the entire family. Admission is FREE! 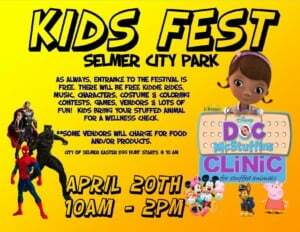 There will be free kiddie rides and other free games and activities. A Doc McStuffins teddy bear/stuffed animal clinic will be set up to do wellness checks on stuffed animals. Live characters such as Black Panther, Thor, Disney Princesses, Peppa Pig, and Mickey & Minnie Mouse will be there. **Some vendors may charge a small fee for their products/services. For more information or you would like to be a vendor at this event, please call 731-610-1881.